Kacey Cleary and her sister run away to Miami four years after the horrific car accident that killed their parents, Kacey’s boyfriend, and her best friend Jenny. Kacey, who was the only survivor of the accident, keeps pushing everyone away and is determined to start a new life where nobody will know the story of their past. However, when she begins to grow close to her neighbor, Trent, it becomes difficult to keep her past hidden forever. I really loved this book! Kacey is really messed up after the accident–her parents’ car was hit by a drunk driver and even though Kacey survived, she was severely injured and spent months in physical therapy in order to walk again. She lost her parents, her best friend, and her boyfriend all in one night, and finds it extremely hard to cope with afterwards. She gets into drinking, drugs, and one night stands, until her sister Livie finally tells her that she can’t deal with it anymore. When their uncle tries to molest Livie, Kacey realizes that it’s time to get away and start a new life where they can put their past behind them. I really liked Kacey because she is simultaneously strong yet vulnerable at the same time. She has suffered so much since the accident and is determined to not build any relationships because she is afraid of losing anyone close to her. This becomes increasingly difficult when she meets her neighbors–a stripper with a heart of gold and a mysterious guy that can’t seem to stay away from her. She begins to care for someone other than her sister and realizes that she can’t keep her past a secret anymore. I loved Kacey’s bond with her sister, Livie. Kacey is determined to take care of her sister and make sure that she does well in school so that she can get into Princeton. She always puts Livie’s needs first and is very self sacrificing. What she doesn’t realize is that Livie also takes care of her in return. Livie is always keeping a close eye on Kacey because she knows that she is still suffering emotionally. Livie has had to grow up faster than usual since the accident, and both girls constantly put their sister’s needs before their own. I really loved their relationship, and it seemed to be the only thing keeping Kacey from breaking down emotionally. Kacey starts to fall for her neighbor Trent, a handsome guy who she seems to run into everywhere. It was a little creepy how he always came to her job at the bar and just stared at her though. I liked that he genuinely seemed to want to help her deal with her emotional stress from the accident, but he did seem a little pushy at times. I had a feeling he was hiding something, but I definitely didn’t expect the twist toward the end! Overall, Ten Tiny Breaths was a moving story about how to continue living after losing someone. I look forward to reading the next book in the series! 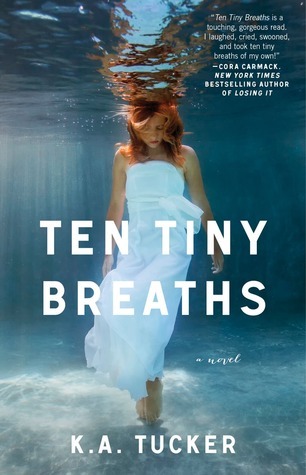 Ten Tiny Breaths was released on February 12, 2013 and is the first book in a series. The second book, One Tiny Lie, was released on June 11, 2013 and follows Kacey’s sister Livie when she goes off to college.